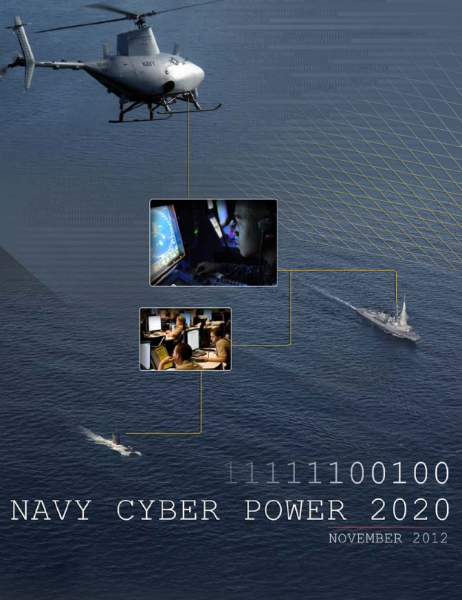 Currently viewing the tag: "Technology Innovation"
Navy Cyber Power 2020 identifies distinct qualities the Navy must possess to succeed, and introduces methods to build a relevant and extremely capable Navy Cyber warfighting force for the future. This strategy examines cyberspace operations from multiple vectors, and considers challenges and influencing factors beyond traditional operational aspects. The way we acquire systems, train cyber professionals, and choose technologies to meet our requirements directly impacts our ability to deliver credible capabilities to deter or contain conflict, and fight and win wars. Implementation and sustainment of this strategy will operationalize cyberspace with capabilities that span all warfighting domains and provide superior awareness and control when and where we need it. Executing this strategy will be hard work and will take a concerted effort at all echelons. Integrated Operations -Fully integrate Navy cyberspace operations in support of achieving Joint Force objectives. Optimized Cyber Workforce – Drive Navy and Joint cyberspace operations with an effectively recruited, trained, and positioned workforce. Technology Innovation – Leverage industry, academia, and Joint partners to rapidly update Navy cyberspace capabilities to stay ahead of the threat. PPBE & Acquisition Reform – Enhance cyber budgeting and acquisition to meet the Navy’s cyber operational needs. The Secretary of Defense’s strategic guidance (DSG) highlights the critical role cyberspace operations play in the success of the Joint Force across all mission areas; the documents below focus on the Cyber Warfare aspect of the DSG. The Nation’s success in the maritime domain depends upon our ability to project power and prevail in cyberspace. Navy Cyber Power 2020 strategic initiatives provide the ways and means to achieve and sustain the Navy’s advantage in cyberspace. We will issue a supporting roadmap detailing lead and support organizations for each strategic initiative and the major actions necessary to accomplish them. However, as cyberspace evolves the Navy’s leadership will periodically assess the strategy of Navy Cyber Power 2020, to ensure it effectively guides the Navy’s efforts to maintain an operational advantage in cyberspace. Furthermore, the Navy will institute a comprehensive set of strategic performance measures to track the Navy’s progress and ensure that our actions are having the desired effect. When necessary, we will adjust course to respond to, if not anticipate, change that continues apace. Our success in cyberspace requires an “all hands” effort, from the Pentagon to the deck plate. Navy Cyber Power 2020 supports the Navy Strategy for Achieving Information Dominance, additional related supporting documents include: the Navy Information Dominance Roadmap, 2013-2028; the Navy IDC Human Capital Strategy, 2012-2017; the Naval Intelligence Strategy, 2013-2020; and, the 2013 Navy Space Strategy. Within this integrated framework, the Navy begins in earnest the process of marshaling its resources, galvanizing the workforce, and aligning Navy’s Information Dominance capabilities to fully enable the Navy’s primary tenet of Warfighting First.